The many songs of Bertrand Goldberg, architect, artist, visionary. Bertrand Goldberg is widely known as the architect who builds round buildings, but little is known about his innovative theories of space and his utopian ideas that have generated these sculptural forms. His work speaks with a vocabulary that is still unfamiliar to some and unappreciated by many. Goldberg’s often repeated statement, "for the first time in the history of the world we can build whatever we can think," seems to have been the beacon guiding his career. While many projects have been fully realized, some others have been only partially implemented, but all have grown out of Goldberg’s unique philosophical, aesthetic, and technological thinking. Born in Chicago in 1913, Bertrand Goldberg first studied at the Cambridge School of Landscape Architecture (now part of Harvard University), then went to study at Staatliches Bauhaus when he was 18, absorbing the language and theory of Ludwig Mies van der Rohe, to solve the problems of the greatest number of people and their widest possible needs. Goldberg paired the transportable, factory produced units and parts for reduced construction costs with modern flexibility of "stronger-than-steel plywood" and concrete (Google quickview; original PDF). Goldberg's earliest commissions were for single family residences, some of which were just recently re-discovered. From there, he went on to create small public housing complexes to iconic mixed-use complexes, a number of hospitals, commercial complexes, and industrial projects. His career stretched from the 1930s to the 1980s, and while many of his creations still stand (some you can virtually tour in video and print form), others are struggling to compete with demands for modern facilities, with supporters proposing ways to preserve the historic design and continue providing modern services. 1. Bertrand Goldberg | Chicago Architect is a treasure trove of information and images. 2. Bertrand Goldberg Archive at the Art Institute of Chicago has an extensive online collection, with the ability to zoom into images in the collection. 3. Ball State University has an hour-long audio recording of a lecture by Goldberg, recorded on 1964-12-02, titled "Architect views architecture." 4. ArchiTech Gallery has the text of a speech about Marina City, presented at the seminar on "Architectural Aspects of Edmonton Civic Centre Plan," Edmonton, Alberta, Canada, on September 27, 1959. 5. Forgotten Chicago has a three part series of articles titled Bertrand Goldberg in Tower Town -- Part 1: Bertrand Goldberg’s Commune; Part 2: Postwar Development of Michigan & Pearson; and Part 3: Bertrand Goldberg’s Michigan Avenue Project. If you're looking to sit down and just read, BertrandGoldberg.org (the first "more information" site) has a beautiful scan of the long out-of-print work Goldberg, Dans La Ville / On the City, in French and English. Goldberg's Prentice Hospital in Chicago is the subject of a bitter battle right now between preservationists and Northwestern University. NU insists it needs to be torn down to build a new research facility that can't possibly go anywhere else (never mind about that empty lot right across the street). A Facebook page for "NU Wildcats for Prentice" (which was formed after the university sent letters and emails to alumni asking themto write the mayor and the Landmarks Commission supporting their demolition efforts) says today that a ruling from the judge regarding the stay of demolition may be coming today. Thanks for this...I've never heard of him before. And I find his Prentice building quite stunning; I certainly hope they can find sufficient skills and imagination - and funding - to adapt and reuse it. dnash, thanks for those details. I can't visit FB pages here, so if you (or anyone else) see anything new, please share the details. The last two links before the "more information" section (others are struggling to compete with demands for modern facilities, with supporters proposing ways to preserve the historic design and continue providing modern services) link to some other Prentice Hospital articles, with the second link pointing to a proposed design that would augment the existing building and allow for expansion to meet current demands. I've always loved Goldberg's organic forms; River City is one of my favorites, but it seems like his buildings often have problems. There are corners that meet at acute angles, which I can only imagine is unsettling, not to mention hard to fit furniture in. Reinforced concrete can look drab and splotchy, especially when it's wet. When I walked around River City, I couldn't help but notice cracks everywhere. River City was originally planned to be a five-building complex, but instead the one building has an ever-present "Condos For Sale" banner. I've been following the efforts to save Prentice and just liked it on Facebook, because I'm for preservation in general, but whenever I see it I think it looks dark and menacing, like that building on every collage campus that is rumored to have been designed to fend off a riot. Hopefully a renovation will lighten up the concrete. That's what they're showing in their renderings anyway. > NU insists it needs to be torn down to build a new research facility that can't possibly go anywhere else (never mind about that empty lot right across the street). NU owns Goldberg's Prentice building, but that vacant lot across the street belongs to NMH, not NU. NU & NMH are separate entities with distinct governance, distinct pots of money, and distinct ownership. NU cannot build on that lot without acquiring it from NMH, just as they would have to do if it were owned by anyone else. One could make an argument that NU and NMH aren't doing enough to work something out, but framing it as if NU has an unused lot is a wildly misleading oversimplification. NU owns Goldberg's Prentice building, but that vacant lot across the street belongs to NMH, not NU. Technically, the empty land is owned by Northwestern Memorial Hospital, which is a separate entity from the central university. However, in practice, Northwestern is not a disinterested party insofar as the land owned by the hospital is concerned. The latter is the teaching hospital for the university, and the two entities have a long history of sharing and exchanging land in this area when it suits their shared interests. In fact, they did so when the threatened Prentice Hospital was originally planned. It was built on land owned by the university, later leased to the medical center, and eventually returned to the university. 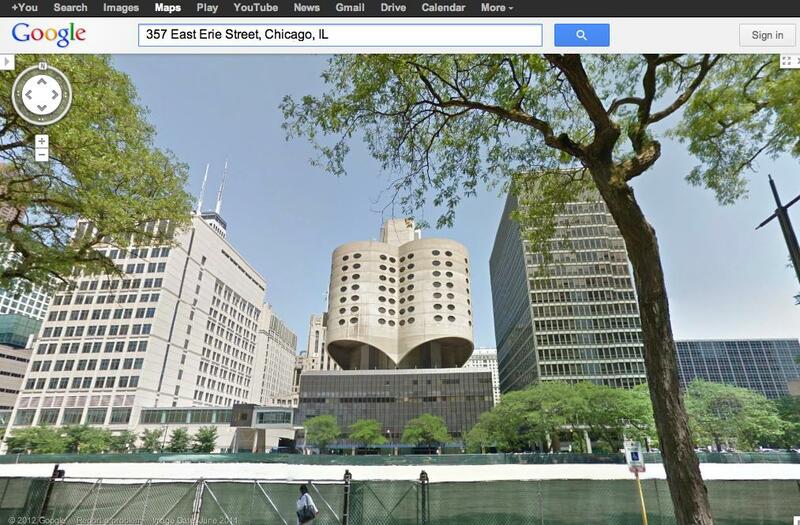 I wonder if Northwestern Memorial Hospital has any plans for the vacant lot. No idea. And it could just as easily be that NMH doesn't want to be saddled with the crumbling concrete clover of controversy either. 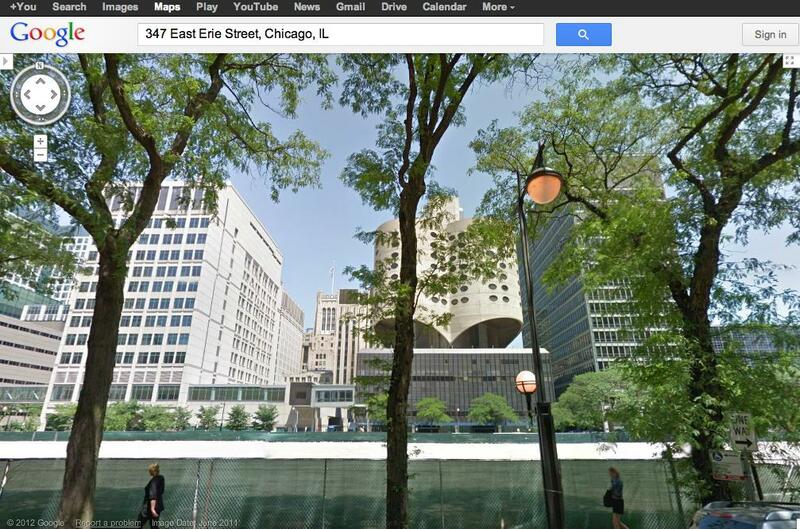 Jeanne Gang of Aqua fame is trying to save Prentice by building on top of it. Her proposed building looks amazing (naturally). As far as I'm aware, the Gang proposal is only an artistic rendering, nothing more -- I don't believe that anyone is actively pursuing it in any serious way. 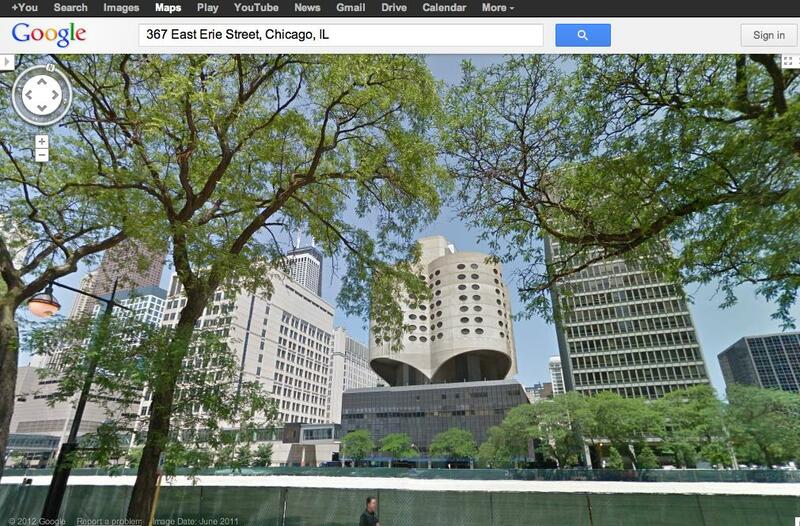 There's no way that Prentice could be bridged to the Lurie Cancer Center (the building on the left) like that. Lurie isn't that tall or that close; it's also not black, so would not be the striking contrast to Prentice depicted in the rendering. Perhaps Gang intends there to be a new black building between Lurie and Prentice? In reality, though, there's not the space; you could build something on top of the low part of Lurie, but it would shade Prentice the way the Rehabilitation Institute on the right does now -- see gallery image 1 for the current view. The Rehabilitation Institute is another building which is misplaced, farther away in the rendering than in reality. Prentice is drearily bereft of windows as it is; can you imagine how dark it would be inside if it were flanked by two buildings like that? There's no way the Hancock would be visible above the "new" Lurie; it's barely visible above the real Lurie at that angle. If you go to 357 E Erie in Google Streetview and turn around, you can get a good sense of how things look from across the vacant lot. Having spent a lot of time in the area, I feel it's a more accurate representation of what you'd actually see than the elevated photo in gallery image 1. Here are three images: 1 , 2 , 3 . Cook County Circuit Court Judge Neil Cohen refused to overturn a decision by Chicago officials to withhold landmark protection from the Streeterville building. But Cohen left in place for another 30 days an order barring its destruction. The extension will give the National Trust for Historic Preservation time to file an amended complaint about the city’s action. Thanks for the follow-up, Westringia F.
Per the article, Northwestern intends to start demolition of the existing structure in 2015. In principle this gives enough time to attempt a digital preservation -- eg, "streetview" style interior photos and a spacial model of its interior & exterior combined to create a computer reconstruction that would allow virtual walkthroughs (and even permit "restoring" it to its envisioned ideal, complete with modeled original furnishings). Something like this could be a good compromise (it might even make the interior more accessible to the public than a physical preservation), but at this point I've only heard idle speculation about doing something like this -- I don't actually know if anyone is seriously pursuing it.